Dramatically increases and intensifies orgasmic contractions leading to more intense pleasure. Take one (1) capsule in the a.m. and one (1) capsule in the p.m. For maximum effectiveness, this product should be used daily. Caution: Not to be taken by those under 18 years of age, or those with hormone-related cancers. If you are taking any prescription drug, or have a medical condition, consult your doctor before using this product. Use only as directed. Do not exceed recommended daily intake. Discontinue use two weeks prior to surgery. KEEP OUT OF REACH OF CHILDREN. Does this product contain any stimulants? No, this product does not contain any stimulants and can be taken with any other product in the line. How does Climax work and what does it do? Climax was designed to increase sensitive during sexual activity while increasing sexual drive. In addition, it was formulated to support longer more intense orgasmic contractions. Can this product be taken with any medications? 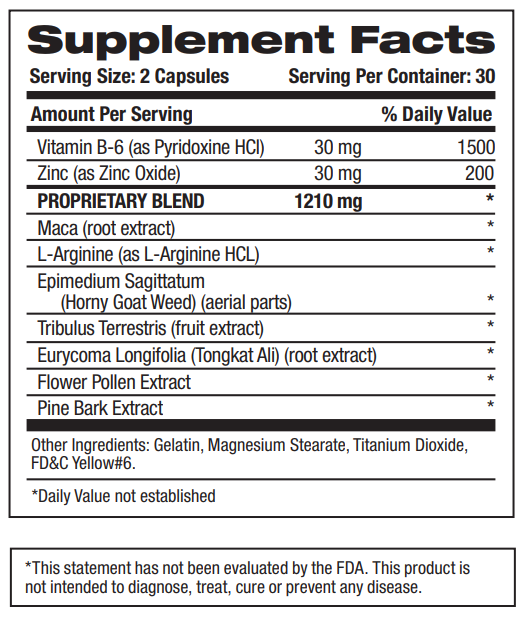 We recommend that anyone with medical questions or concerns consult their doctor before taking any of our products.